Donations. Glorious donations. Where would we be without them! The Red Box Project would not exist without the kindness bestowed upon us by others. There are times when The Red Box Project feels that items simply cannot be accepted, not because we don’t appreciate them (we really do) but because there are health implications that cannot be ignored. We want our young people to receive the highest quality of protection throughout their period. Outlined below are some points to consider when you make your generous donation. The lifespan of a tampon is said to be 5 years. Whilst tampons are a sanitary product they are not sealed as a sterile product. This means that they are highly susceptible to mould and infection. The difficulty is that a freshly, wrapped tampon after their expiry dates has passed, will still look the same as one’s bought more recently. With this in mind, we cannot accept loose, freshly wrapped tampons under any circumstance. The danger is that the tampon can hide mould inside the applicator which can cause irritation and infection and in more serious cases, onset of Toxic Shock Syndrome (TSS). Loose tampons (unwrapped) and are obviously a definite no-no. In short, The Red Box Project asks that donations of tampons are in sealed boxes. 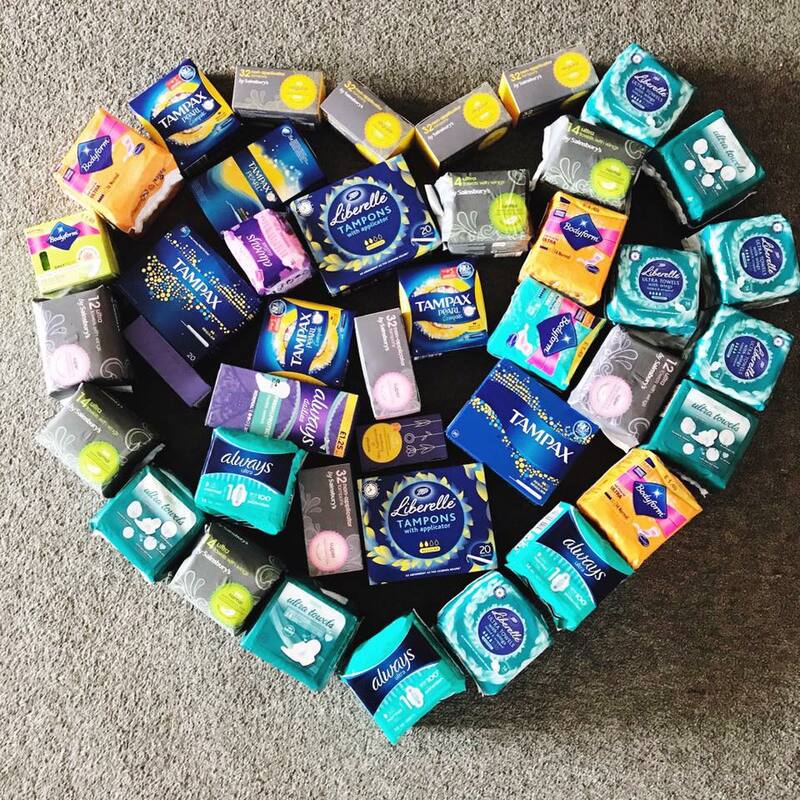 Some brands such as Carefree do not use expiry dates whilst Tampax show two dates on their boxes: one is the production date and the other is the expiry date. Currently, organic tampon brands do not have to state their expiry date. It is a bit of bloody minefield so I think you’ll agree that it is 100% better to air on the side of caution. The Red Box Project believes that the products we provide to young people must be of the highest quality and presented in a way that we would want to use ourselves. We don’t just believe that access to suitable menstrual products is important; a young person’s confidence and dignity around menstruating is paramount. What items are best to donate…? Our demographic is young people aged from between 10 and 18. Our most sought after items are pads in various sizes and absorbencies. We like to offer pads with both wings and no wings as well as products that are hypoallergenic and sensitive. We also stock our boxes with underwear. This goes without saying but has happened recently: please only donate underwear that is fresh and wrapped – no second hand undies please! Tena pads are probably not ideal donations. Always try to be mindful of where the products are going. It is sometimes difficult to differentiate the products on offer, especially as incontinence pads are often placed next to other products. We are contacted daily about why we don’t stock our boxes with reusable pads and mooncups. The answer is always this: when we started The Red Box Project we carried out research in our local area. The young people we support through this project use the box because they know that they can take from it products they know and feel confident about using. Without education and guidance around inserting a mooncup and without having daily access to washing and drying facilities, as well as the needed space, time and facilities to sterilise them, these products are just not suitable or appropriate. We truly believe that young people should be given the same choices that we have all had when choosing what products to use. The environmental issues around using the products we use are undeniable but so too is placing a product in to a box that confuses and ultimately prevents a young person from having protection throughout their menstrual cycle. Setting aside personal opinions can be very difficult but the focus is always on the young people we are supporting. We welcome and LOVE organic and eco-friendly sanitary wear pads. How can I make a financial donation to The Red Box Project…? You can donate to The Red Box Project via Paypal below. The Red Box Project is a community group and all funds raised are put into the project to ensure as many young people have access to the products they need. You can also support individual boxes in your town or city by looking to see whether there is project in your local area here.